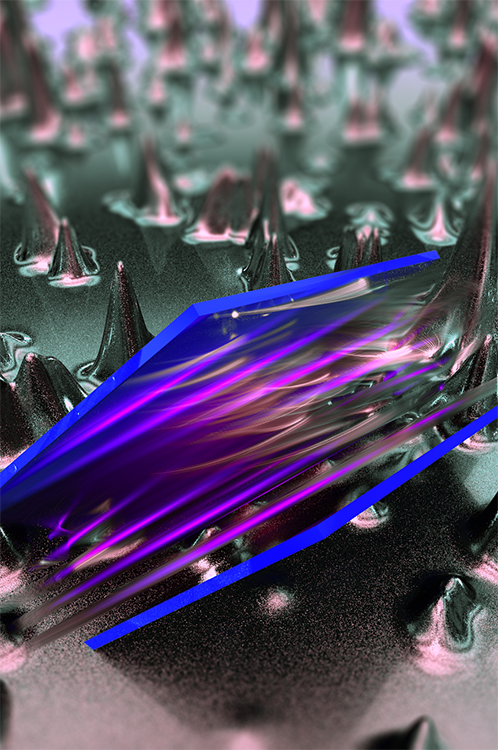 An artistic representation of a tiny force called the Casimir torque (purple streaks), which is studied by observing the interactions between two solids (blue) against a background of quantum fluctuations (silver spikes). When placed together in a vacuum less than the diameter of a bacterium (one micron) apart, two pieces of metal attract each other. This is called the Casimir effect. The Casimir torque—a related phenomenon that is caused by the same quantum electromagnetic effects that attract the materials—pushes the materials into a spin. Because it is such a tiny effect, the Casimir torque has been difficult to study. The research team, which includes members from UMD's departments of electrical and computer engineering and physics and Institute for Research in Electronics and Applied Physics, has built an apparatus to measure the decades-old prediction of this phenomenon and published their results in the December 20th issue of the journal Nature. "Experiments like this are helping us better understand and control the quantum vacuum. It's what one might call 'the physics of empty space,' which upon closer examination seems to be not so empty after all," said John Gillaspy, the physics program officer who oversaw National Science Foundation funding of the research. "Classically, the vacuum is really empty—it is, by definition, the absence of anything," said Gillaspy. "But quantum physics predicts that even the most empty space that one can imagine is filled with 'virtual' particles and fields, quantum fluctuations in pure emptiness that lead to subtle, but very real, effects that can be measured and even exploited to do things that would otherwise be impossible. The universe contains many complicated things, yet there are still unanswered questions about some of the simplest, most fundamental phenomena—this research may help us to find some of the answers."